I did not even notice that she put Shine in a different color thread. Wow. I don’t know where the custom started, but it’s a good one. Instead of making New Year’s resolutions, people will select a word that they hope will shape the year. My word in 2013 was Perseverance (the word of the year always goes in caps–lol), in 2014 it was Risk. Given that 2014 was a great year in terms of my writing endeavors, I had pondered keeping my word, but then just the other day something occurred to me. At almost every point whenever I had a success in 2014–my second Golden Heart nomination, my books hitting the Amazon bestsellers lists, my two Emma nominations–I always felt compelled to apologize in some way for it. It has been a real struggle for me to just take in the high points without apology, explanation or even a slight feeling of embarrassment. These emotional reactions have to stop. So I have selected a new word for 2015 that I hope will help me with my issue–Shine. Shine is a word that does have some negative meanings, even racially, but I’m going to explain what it will mean for me this year. I was raised by a very wise woman who taught me to reach far and to seek accomplishment, but once those goals were attained, then the accomplishment should be downplayed so that other people would not feel uncomfortable. My beautiful mother, who was one of the first black female business executives in the Pittsburgh area, steeped herself in this principle and I followed her example. However, I’ve learned a particular codicil to this belief. It doesn’t matter what you do or say, there will be some people who cannot deal with it. I experienced this directly on Twitter when someone, who I thought of as supportive, engaged in subtweeting (talking about something that I said without referring to me directly). If someone has a problem with something that I’ve said, I would expect for them to engage me directly. So disappointing. This experience convinced me that I need to do and say what comes from my heart. No matter what, there will always be someone who has a problem. But that is their problem. Not mine. I do not need to be, or desire to be, “in your face” about what I do, but I don’t believe my mother wanted me to feel embarrassed or apologize for it. I know this is true because “This Little Light of Mine” was one of her favorite spirituals. When my mother’s illness changed her appearance, my cousins wanted to honor my mother with a quilt where everyone created a block representing how they felt about her. They were sneaky and made her make her own block that represented advice that she would give to the children of the family. 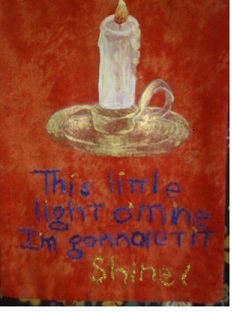 She chose to paint and embroider (in her creative way) the block that I’ve shown here. It’s in the center of the quilt. Also, as I reflect upon the true meaning behind her philosophy, there are other songs that she liked that were always referring to bringing light–“Shine, Jesus, Shine” and “We Are Singing for the Lord is Our Light.” Ahh. Now I get it. So. Shine. No more explanations or apologies about the choices I’ve made in terms of the publisher I’ve chosen to put forward the three Bledsoe Sister books later in 2015, no more embarrassment about taking Milford College into the 20th century this year, just–do it to bring light. Embracing Shine will not be easy. It was hard for me to even write this post. It’s an every day battle to reinforce the belief that I have a voice worth listening to, or a point of view that matters. But I believe that Shine will help me with this in 2015. And it starts in 2015 with the first blog post that discusses the next Milford book–The Representative’s Revolt. Onward and upward! Aww, thank you Velmer! Thanks for stopping by and commenting! I’m basking in your light! Shine on, Shine! Thank you Parker–Your light has been inspiring to me as well! Thank you for stopping by! I love your Shine. It has inspired me every since we met on FB. Looking forward to more of your shine in 2015. You inspire me too LaShaunda! Thank you for your kind words and for stopping by! And you shall Shine Beautifully PIper in 2015.. What a great idea to chose a Word instead of lots of resolutions. I’ve picked my word already for next year, being inspired by you.. it’s Illumination. I love your word and I’m glad my post helped! Thank you for stopping by and commenting! Beautifully said! My word for 2015 is Service. I want to be sure my work, my family, and my personal goals are working in service of the Lord. A wonderful word! I think of Shine in the same vein. Apologizing means that I’m apologizing for the Lord and that just won’t do. Thank you for stopping by! What a wonderful idea. Beautiful post. I love the idea behind picking a word for the year, Piper! In yoga, we call it setting our intention. It becomes the touchstone, the guiding light, the word I come back to when I feel off-balance, either physically or emotionally. So in honor of your picking Shine (which I absolutely think you shall! ), I choose Centered. No matter what curves life throws me this year, I shall stay true on course and let nothing throw me off balance. Thanks for the idea! Thank you for putting it in context Ellen with the yoga example. That sounds so cool. I love the word you chose–a great one! Thank you for stopping by and commenting! Shine on, SIL! Excellent words and an appropriate word!! All of us can learn and grow from this advice. No more apologies or “it’s no big deal” when others acknowledge (even negatively) the amazing things God has done in our lives. Thank you BIL! I appreciate your kind words and the reminder that to apologize is to run contrary to what God would want for us. Thank you! I do understand how you feel, so I’m proud of you for taking this step. I look forward to 365 days of watching you SHINE, Piper! What a beautiful post! I hope 2015 is your to shine EVEN BRIGHTER….God bless! Every time i think of the word “shine,” I get image of the movie “Robots” and the voice of Mel Brooks filters into my head. Good concept. That’s the parent in you coming out! Thanks for stopping by Walt! May we all learn to shine brighter in 2015! Yes Carol, I remember how this went viral when Oprah had featured her on her show. And you are so right! Thanks for the reminder!